Custom Air Conception Vittorazi Moster Titanium Paramotor under 22kg!! 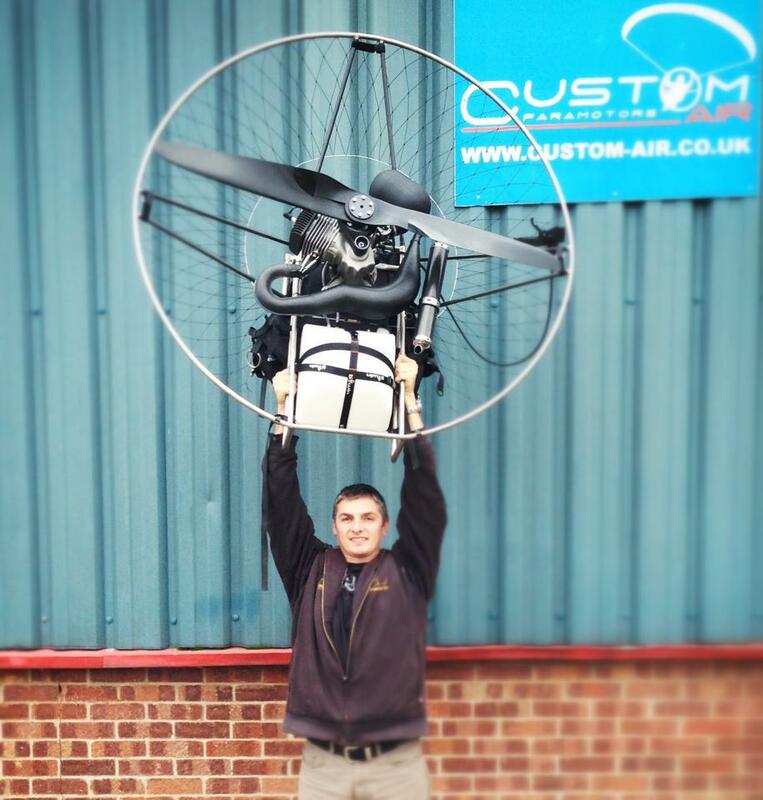 Vince from Custom-Air Paramotors showing off the latest AirConception Titanium Paramotor. This Vittorazi Moster powered paramotor claims 74kg thrust yet remains a mere 21.6kg all up ready to fly weight. Vince says its super strong titanium chassis is unmatched in the strength to weight department + the titanium reinforced 3k carbon spars are strong and super light. At 21.6kg its the lightest moster paramotor I have seen, but its not our lightest motor, for that we have another machine with 64kg thrust and it is yet another 2kg less weight. This minimalistic design is not to everyones taste but the power to weight is sure to raise a few eyebrows. There is plenty of camping and parking, toilets sorry no showers though although if the tides in ya can jump in the river should you wish. We are not charging for camping or flying etc but we will have two tins for donations, to the farmer and the local childrens hospice. Refreshments will be available Tea/Coffee burger’s etc bacon roll’s £1.80 Mmmmmm. The event is for everyone new or old to the sport there is no minimum hours required to fly and there will be one or two instructors about over the weekend so if you intereasted in taking up the sport this is the ideal time to come along and talk to people about it. We are hoping to have some fun and games over the weekend and are aiming for a friendly fun atmosphere so dont be shy come on down!!!! This post code SS3 0LN will take you to the entrance of the farm, as you come along Litttle Wakering Rd there is a Nursery called Little Rascal’s along side of the nursery you will find the drive way to the farm its fairly long and fairly bumpy, PLEASE NO SPEEDING 5mph. You will be able to get onsite from 2pm Friday 24th if there are people who want to arrive later than 8pm let me know please so we can keep gates open for you. You can arrive on site Sat & Sun from 6am. If the weathers good this is going to be a fantastic event so don’t miss it.